* A green keeper's story. Lawn mowing is quite literally a ‘straight forward’ job I suppose. But as you go along you can't help learning a few good tricks - because there are always easier and better ways. This page reveals the working methods to use with lawn mowers. I explain about pre-mowing treatment, cutting patterns, lawn edging, sloping lawns, and grass collecting. 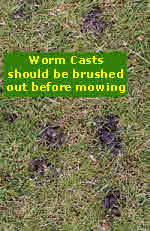 Before mowing a fine lawn, do check for worm casts. These small mounds of earth will allow weed seeds to germinate. You can use a stiff brush to disperse them. When mowing rectangular greens a cut along the longest edge helps you to line up all subsequent cutting strips for you. And this guide is even more useful where the lawn follows a long curved path. The featureless nature of a large lawn is bewildering without some form of guideline and this job requires concentration. Lawn mowers with powered travel take your weight off the handles so you can focus on track. So start by mowing across at one end, then do the long edge. Cross cuts at each end provide a turning area or baulk to save you walking on flower beds. And as turning the lawn mower often requires a slight lift at the front end, a cross cut at that point is essential. Note that ride-on mowers turn completely on the spot. Do take care to line up each strip carefully before you begin. Allow a small overlap on the already cut side. Lawn mowers with rear rollers add a nap to the grass blades. Strips are lighter when viewed along the direction of cut. So the light green dark green stripes change their shade depending on the direction from which you view them. 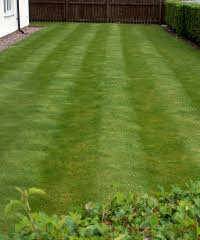 A raised cutting height intensifies the stripe effect. The finest greens for golf putting, bowls, croquet, tennis, and the like are given an additional cross mow. The second cut can be done with the grass box off. Otherwise this may result in a check pattern. 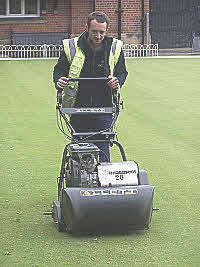 But its purpose is to make a finer cut and grow an even surface. If you don't cross mow a fine lawn then any unevenness can be accentuated. So you should at least mow your strips at right angles to those of the previous grass mowing session. Emptying the grass box is undoubtedly the most tedious part of mowing. You can save time by placing bags at strategic points to collect grass cuttings. Note that some wheel barrows come with extensions to increase their capacity. Lawn mowers that have a large grass box are a distinct advantage when mowing extensive areas. 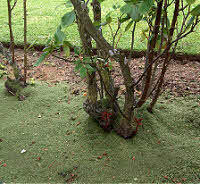 Another time saver is to put the grass trimming directly onto to earth around nearby shrubs and hedges. They conserve soil moisture and recycle nutrients to your plants. Only don't lay them thickly on shallow rooting plants like Azaleas. After mowing your lawn, do lawn edging. Also, weed the immediate flower border. Then it's easy to pick up all the debris together. Power lawn edgers: do the job in one go; NOTE:- the most advanced tools combine edging, strimming and pole trimming hedges all in one tool. Edging shears:- simply cut grass that protrudes sideways along raised lawn edges. When this job is done weekly the trimmings can be left to lie. Half Moon edging spade: neatens and re-aligns the edge at the start and end of the season and perhaps also to get the best look in mid-summer. Top class detailed lawn care advice.